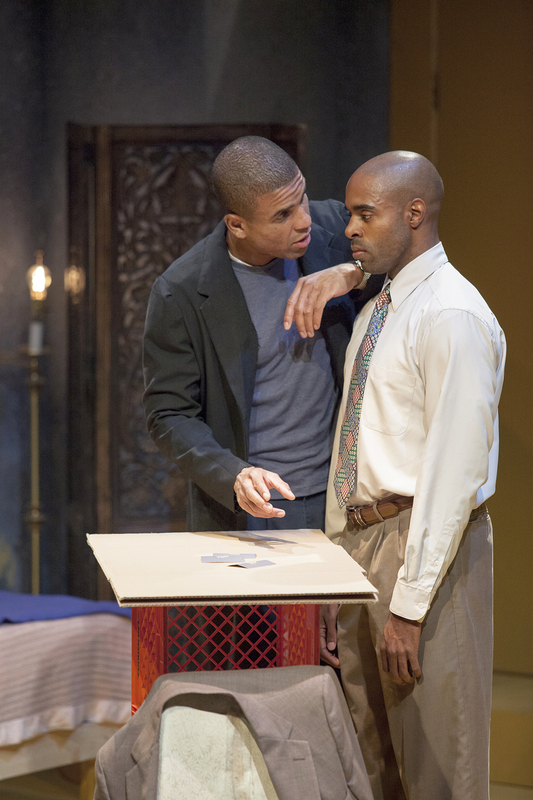 St. Louis Actors’ Studio is presenting a wonderful acting lesson with two St. Louis actors at their best in Suzan-Lori Parks’ “Topdog/Underdog.” But when you have the two characters in the play named Booth and Lincoln, you know the outcome of the play, and you just hope getting there is worth the journey. 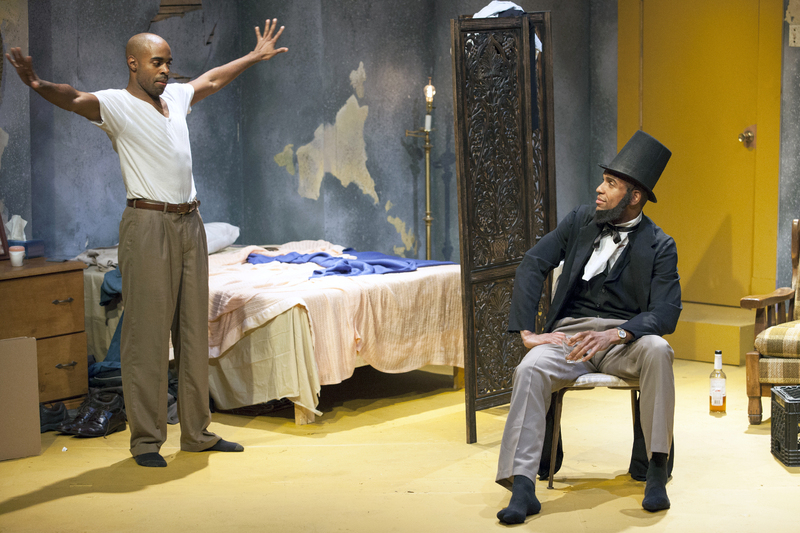 Well, it is thanks to Chauncy Thomas and Reginald Pierre as two black brothers who are living together in a cramped apartment. They make the journey worthwhile even though this Pulitzer Prize winning script isn’t always as tight as you’d hope it would be. On top of the somewhat contrived premise of the names, Lincoln is donning a beard, long coat and top hat at his job which is playing Abraham Lincoln pretending to be sitting at the theatre where people then come in and shoot him from behind. Who thought this up as entertainment? There was a one-act I saw many years ago called “I Married Irene Because She Has Eyes Like Abraham Lincoln.” That was a comedy with basically the same outcome when the couple went to a costume party and she was dressed as Honest Abe and was shot by a man dressed as Booth. This is a drama, however, and it not only loses credibility with this outrageous premise, but also has a lot of dialogue that sounds like a rehash of what the brothers have been talking about all their lives. Plus a lot of repetition is prevalent in the script. Their mother left and, two years later, their father abandoned them as well when Lincoln was 16 and Booth 13. Lincoln’s marriage has broken up and he moves into this small apartment with his brother where the bathroom is down the hall and the only thing in the place is a bed and a chair (where Lincoln sleeps) and milk crates with a piece of heavy cardboard resting on top. Booth opens the action by practicing his three card monte on the cardboard and it’s obvious he couldn’t fool any “marks” in the pretend audience with his slow moves and even lamer patter. Lincoln, coming home from his job- which is in jeopardy due to the boss thinking a wax figure of Lincoln might be more feasible- and refuses, once again, to even touch the cards. He was “the man” back in the day but an unfortunate incident cost him one of his friends and he doesn’t want to start the “game” again. Chauncy Thomas is powerful as the scheming Booth. He doesn’t work so Lincoln’s pitiful job is the only thing keeping them in the miserable apartment. Thomas is outrageous and bodacious as he brags about his inept three card monte (he even wants to be called “three card”) and his way with his (real or imagined) relationship with his old flame, Grace. He lives by his wits and petty theft but keeps his hopes high for learning to deal like his brother. Reginald Pierre is also wonderful as the often quiet and understated Lincoln. He’s the older and wiser and tries to keep Booth’s anger and his dreams from getting the best of him. They work marvelously together and despite the discrepancies in the script, make believers out of us. Their pain, their moments of joy and their eventual resolution on being abandoned as children are all highly charged and convincing. Director Elizabeth Helman does a beautiful job in wringing every emotion from the script. She adds a humanity that is rare to find on a stage and you know these brother truly love each other- as we see tenderly brought out in the final, heart-wrenching seconds of the play. Christie Johnston has given us a truly realistic set design and the Patrick Huber lights add to the squalor of the surroundings. Carla Evans costumes add the right touch from the Lincoln costume to the new threads “lifted” by Booth. “Topdog/Underdog” is a tough play in its demeanor and often tough to watch as we peek into the hard life and even harder times now for these two brothers. But it’s a wonder to behold with two fine actors giving it their all with every gritty story and even grittier dialogue. Call 314-458-2978 for tickets. “Topdog/Underdog” runs through October 6th. This entry was posted on September 23, 2013 at 9:43 pm09 and is filed under Uncategorized. You can follow any responses to this entry through the RSS 2.0 feed. You can leave a response, or trackback from your own site. This show was NOT TO BE MISSED. You are so right, Lisa. What powerful performances!